ISA shared interrupts, as implemented on Amplicon serial boards, enabling more than one serial device to share an interrupt resource successfully without conflicts. RS485 half duplex transmission options enabling multiple RS485 ports to communicate in half-duplex (two wire) mode. 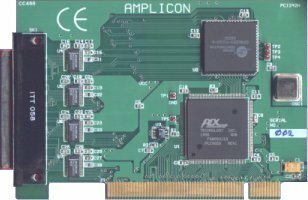 This driver is capable of driving the standard Amplicon RS485 cards, as well as external RS485 adaptors. The drivers are Microsoft compatible allowing you to use the standard WIN32 serial communications interface in whatever hi-level language you like; C, C++, Delphi, etc. It also means that applications written to use this standard interface will automatically work with the new Amplicon features.